Not to be confused with World 7-4. 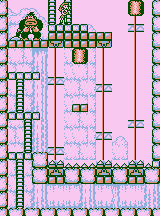 Stage 7-4 is the fourth level of the Iceberg in the Game Boy version of Donkey Kong. The level is the first encounter with Donkey Kong on the Iceberg. Mario starts at the bottom of the level. He must head left over to some ladders and climb up to the middle, then wait for Donkey Kong to pull the switch so the first elevator is going up instead of down while the second elevator goes down instead of up. Mario then must jump onto the first elevator and ride it up while moving close enough to the edge without falling into the spikes to get the Kurasshā to try to crush him. Mario can then quickly jump on the platform the Kurasshā is above once it raises back up, then jump onto the next elevator; alternatively, he can jump from the Kurasshā itself to the elevator. Mario must then jump from the second elevator to the third, then quickly jump back to the second to avoid getting crushed by the Kurasshā before riding back on the third (or on the Kurasshā) up to the top. Mario must make a jump over to a platform, then he must simply walk up to Pauline to end the level with Donkey Kong taking her away again and Mario continuing to give chase. Donkey Kong and Pauline stand on a platform in midair, then Icicles begin to form on a platform above and are about to fall. Mario arrives and is almost hit by the one on the left due to the slippery blocks but manages to avoid all of the icicles, then he uses the icicles to jump to the platform with Donkey Kong and Pauline. Donkey Kong, shocked by this, grabs Pauline and runs with Mario behind him. The player is then given lives based on their score. This page was last edited on April 10, 2018, at 12:50.